Make a perfect gift for your special ones by sending our Tasty Assorted Dry Fruits consisting of Almonds, Pistachios. 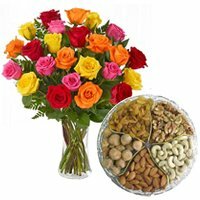 Raisins, Cashews and Walnuts with Magnificent Mixed Color Roses. This 1 Kg. Assorted Dry Fruits and 24 Mixed Roses will leave a treasured memory with your loved ones.